We are currently raising funds to build a 9-12k square foot skatepark inside Willard park. The design has been funded by a donation from CICF. The construction of the park will cost $30 a square foot. 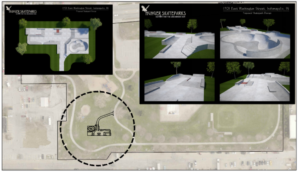 The project is being organized by a community group called the Indianapolis skatepark Advocates. The neighborhood and skatepark users all around Indianapolis have had a strong influence on the developing design.